From the authors of the very successful Unseen London comes London Uncovered, a new book that explores some of London’s lesser known institutions, buildings, homes, shops, museums and attractions. Award winning photographer Peter Dazeley and writer Mark Daly tell the stories behind sixty of the capital’s most fascinating locations. 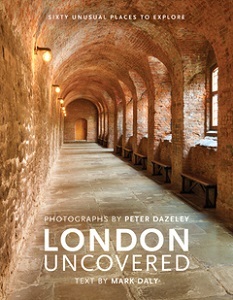 Unlike Unseen London when the locations were generally inaccessible to the general public, London Uncovered includes places that are open to visitors but not widely known. The various sections of the book are subjects that illustrate the wonderful diversity of London, the book features Historical Homes, Food and Drink, Places of Entertainment, Places of Worship, Remarkable Shops, Science and Education venues, Inns of Court and Unusual Museums. Each subject includes Peter Dazeley’s images and Mark Daly describes the history and the character of each place. The section on Historical Homes provides evidence of how the rich and the wealthy tried to create a legacy in bricks and mortar. Syon House and Kew Palace were built for elite families, Aspley House was the London home of the Duke of Wellington, Eltham Palace and Two Temple Place are examples of ‘new money’ imitating former wealth and the Charles Dickens Museum is a wonderful example of a 19th century London townhouse. Food and Drink features Dr Johnson’s local (Ye Olde Cheshire Cheese), the original Michelin restaurant (Bibendum), traditional London Pie and Mash café ( L. Manze) plus media and actors hangout (The Ivy). Places of Entertainment delves into how many buildings which are great examples of one type of entertainment have found another use for other entertainments, Wilton’s Music Hall, Rivoli Ballroom and the amazingly decorative Gala Bingo Club are remarkable survivors that reflect past glories. Places of Worship range from the grand Westminster Cathedral to the bizarre Masonic Temple at Andaz Liverpool Street Hotel. Equally unusual is the Inns of Court which have provided a base for lawyers and barristers for centuries. Buildings within the Inns often display many diverse styles and periods. Britain was one of the first industrial powers and Science and Education venues pay tribute to the 19th century obsession with power in all its forms. Kempton Steam Museum, Markfield Beam Engine Museum and London Museum of Water & Steam remember the work of the great engineers, whilst Alexander Fleming Laboratory Museum and Royal Institution of Great Britain focus on great scientists. Remarkable shops such as L. Cornelissen & Son, Truefitt & Hill, Steinway & Sons, James Smith & Sons and John Lobb Ltd reminds us of a time before the various chains dominated the high street and Unusual Museums introduce us to the joys of the Horniman Museum, Churchill War Rooms, Geffrye Museum, Musical Museum and Wimbledon Windmill. These type of London books are relatively common but what sets this book apart from its rivals are the stunning and lavish photographs of Peter Dazeley and the entertaining informative text from Mark Daly. This attractive and intriguing book will appeal to Londoners and visitors who like to look beyond the main attractions and find those strange, gaudy, beautiful and historic locations that make London a city that is full of diversity and fascination. By londonvisitors2014 in London Book Review - Non Fiction on September 30, 2016 .